FTP to Zip is a simple WordPress Plugin to backup your WordPress FTP using PHP ZipArchive to a ZIP file, save it on server and gives option to download. This is the official page of FTP to Zip Plugin. Please note that, for the basic function and detailed instruction on how to use this FTP to Zip plugin, we wrote in details in the post WordPress FTP Full Backup. For various reasons, we needed to rename it as FTP to Zip retaining all the functions in this first version. Unzip it on desktop and upload two files of the folder ‘backup.php’ and ‘run.php’ to the WordPress Installation root or any directory. Simply follow the on screen instruction, it absolutely looks like the default WordPress installation screen. FTP to Zip is available in GitHub and Google Projects as WordPress FTP Full Backup, if you are a developer and want it for usage for other CMS or want to add features, simply download and proceed. History does not mean, when I installed gedit to write the coding for FTP to Zip ! The history is, Rackspace Cloud Site users has no shell access and have a custom and advanced control panel. So despite being an advanced Cloud Computing platform, taking the backup of FTP is quite painful as one can not zip it oneself through SFTP client. FTP to Zip works nicely on Rackspace Cloud Sites, it should work on any LAMP server (Server component are – Linux Apache PHP MySQL) with good hardware backend. 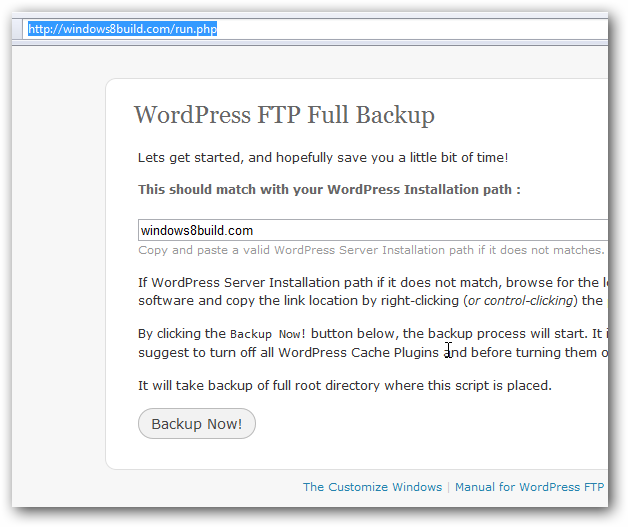 As I said, it was named WordPress FTP Full Backup first, but has changed to FTP to Zip now. Other things remained the same for our FTP to Zip Plugin. Line 23 : $sourcefolder is set to root. You can change it yourself. Line 25 : $timeout is the maximum php execution timeout. It sets ini_set(‘max_execution_time’, $timeout); on Line 34. Line 24 : $zipfilename is the name of the backup zip as output. You can change it as you like. Calling another php function will give pretty name increasing the load (its quite logical). Line 38 : $zip = new ZipArchive(); is the main action we are doing with FTP to Zip. Line 71 to Line 88 : The PHP functions are wrapped inside h1 to show the page title as per the situation. Uploading to Rackspace Cloud Files via API with auto selection of method (cURL or Python) as well as to usually used blob based Cloud Storages, including Dropbox will be added in FTP to Zip. Please be aware that, there are WordPress Backup Plugins which uses API from own domain or subdomain for uploading to Cloud backup sites. You are using FTP to Zip or other plugin does not matter, it matters to check the API yourself in the source code whether they are from official website (s).